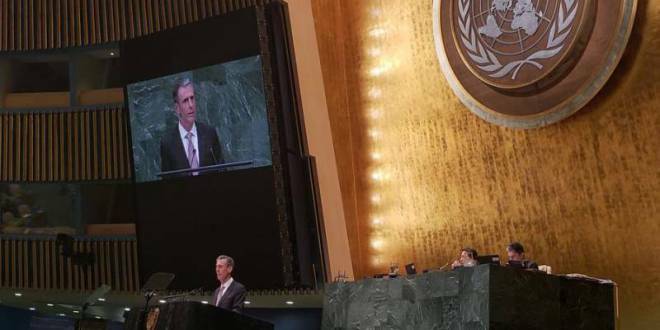 This September, Minister of Foreign Affairs and Cooperation Gilles Tonelli took part in the 73rd session of the UN General Assembly in New York. In his speech during the General Debate, Mr Tonelli highlighted the Principality’s strong confidence in multilateralism (text of the full speech available below). Mr Tonelli also took part in the High-level Meeting on Financing the 2030 Agenda for Sustainable Development, which brought together a large number of politicians and economic leaders; attended the Security Council meeting for heads of state and government, held at the initiative of the United States which chaired the meeting; and took part in a side event on combatting plastic pollution. During his week at the UN, the Minister conducted numerous bilateral meetings with his counterparts from Vanuatu, the Baltic states, the United Arab Emirates and Azerbaijan, and with the Canadian Minister of Tourism, Official Languages and La Francophonie, the First Lady of Niger, the French President’s Special Envoy and Coordinator of the Presidential Council for Africa, and the Secretary General of the Union for the Mediterranean, with whom he discussed some of H.S.H. the Sovereign Prince’s priorities including efforts to combat pollution, marine protected areas, water management and support for the IPCC. During a meeting with Malta’s Minister of Foreign Affairs and Trade Promotion, an agreement on avoiding double taxation and preventing income tax evasion was signed between the two governments. Finally, Professor Patrick Rampal, Chairman of the Board at the Monaco Scientific Centre, took part in two high-level meetings on health, covering tuberculosis and the prevention and control of non-communicable diseases. During the latter meeting, Professor Rampal presented the many prevention and cooperation activities being undertaken by the Principality. In addition, H.E. Ms Isabelle Picco, Monaco’s Permanent Representative to the United Nations, accepted the Presidential Award for Economic and Sustainable Development in Healthcare Finance from Harvard University on behalf of H.S.H. the Sovereign Prince. This recognition honours H.S.H. the Sovereign Prince’s commitment to offering excellent healthcare in the Principality, as well as the Government’s international cooperation efforts in this area.